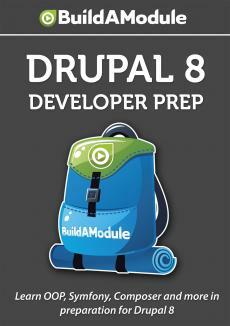 The module that we're going to go through the upgrade process for is the trails module that we created in our Drupal 7 development core concepts collection. We're going to work with an earlier version of the module just so we have a limited number of APIs and pieces that we're working with during the upgrade process. This will make it manageable. So, what I've done is I've enabled the trails module on a Drupal 7 site, and let's take a quick tour of what the module does so we know how to know whether it's working completely in Drupal 8. Now, the basic thing that this module does is it enables a block that shows the last pages that have been visited by any user. In future versions of this module we store that data in the database, and we show unique information about the user that's creating the trail. But in this one it's just one trail block that shows visited pages regardless of user. So, the first thing we need to do is enable the block, and we can do that by going to structure and blocks. And then we'll scroll down and history is the name of the block that we want to enable. So, we'll select a region for it. Let's go ahead and select sidebar first and click save blocks. Now, let's exit out of the overlay, and over here on the left hand side we have the set of pages that have been visited.